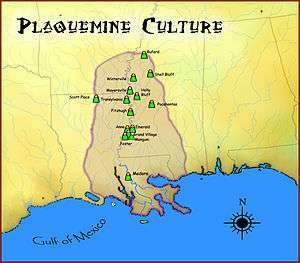 A map showing the geographical extent of the Plaquemine cultural period and some of its major sites. 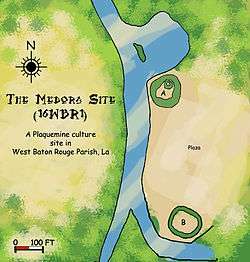 The Plaquemine Culture occupied the rest of Louisiana not taken by the Caddoan Mississippian culture during this time frame. Its people are considered descendants of the Troyville-Coles Creek culture. 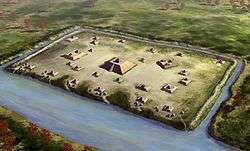 A prominent feature of Plaquemine sites are large ceremonial centers with two or more large mounds facing an open plaza. The flat-topped, pyramidal mounds were constructed in several stages. Sometimes they were topped by one or two smaller mounds. Mounds were often built on top of the ruins of a house or temple and similar buildings were usually constructed on top of the mound. In earlier times, buildings were usually circular, but later they were likely to be rectangular. They were constructed of wattle and daub, and sometimes with wall posts sunk into foot-deep wall trenches. At times, shallow, oval or rectangular graves were dug in the mounds. These might have been for primary burials, but more often they were for the reburial of remains originally interred elsewhere. One kind of pottery occasionally placed in the graves is called "killed" pottery. This type has a hole in the base of the vessel that was cut while the pot was being made, usually before it was fired. They also decorated their pots in other characteristic ways. They sometimes added small solid handles called lugs and textured the surface by brushing clumps of grass over the vessel before it was fired. They often cut designs into the surface of the wet clay and, like their Caddoan contemporaries, the Plaquemine peoples engraved designs on pots after they were fired. Plaquemine peoples also had undecorated pots that they used for ordinary daily tasks. Pottery during this phase still used dry clay particles as a tempering material, with the use of ground shell being a marker for Mississippian cultural contact. Lake George 1350 to 1500 CE Foster 1350-1500 CE Fitzhugh Gran Marais ? 1250-1350 CE ? Beginning during the Terminal Coles Creek period (1150 to 1250 CE), Mississippian cultures far upstream from the Plaquemine area began expanding their reach southward. Excavations in the Yazoo Basin area of Mississippi have shown a Cahokia Horizon as extra-regional exotic goods, such as Cahokian pottery and other artifacts, began to be deposited in Coles Creek-Plaquemine culture sites. Through repeated contacts, groups in Mississippi and then Louisiana began adopting Mississippian techniques for making Mississippian culture pottery, as well as ceremonial objects and possibly social structuring. The Plaquemine peoples absorbed more Mississippian influence and the area of their distinct culture began to shrink after 1350 CE. Eventually the last enclave of purely Plaquemine culture was the Natchez Bluffs area, while the Yazoo Basin and Louisiana areas became a hybrid Plaquemine Mississippian culture. Historic groups in the area during first European contact bear out this division. In the Natchez Bluffs, the Taensa and Natchez, had held out against Mississippian influence. They continued to use the same sites as their ancestors and carry on the Plaquemine culture. Groups who appear to have absorbed more Mississippian influence were identified at the time of European contact as those tribes speaking the Tunican, Chitimachan, and Muskogean languages. Anna Site Located in Adams County, Mississippi 10 miles (16 km) north of Natchez. The type site for the Anna Phase (1200 to 1350) of the Natchez Bluff region. Emerald Mound Site A Plaquemine/Mississippian site approx. 8 miles from the Mississippi town of Natchez. 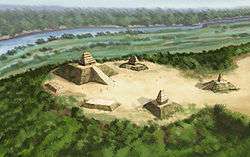 The second largest pre-Columbian structure in the USA and is the type site for the Emerald Phase (1350 to 1500 CE) of the Natchez Bluffs region. 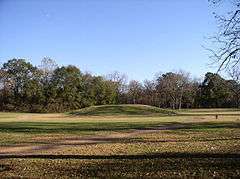 Fitzhugh Mounds A Plaquemine/Mississippian site in Madison Parish, Louisiana which dates from approximately 1200–1541. It is the type site for the protohistoric Fitzhugh Phase (1300-1400 CE) of the Tensas Basin Plaquemine Mississippian chronology. Flowery Mound A single mound Late Coles Creek to Plaquemine/Mississippian site in Tensas Parish, Louisiana which dates from approximately 1200–1541. Foster's Mound A two mound site in Adams County, Mississippi which dates from approximately 1350 to 1500 CE and is the type site for the Foster Phase. Holly Bluff Site A Plaquemine/Mississippian site from central western Mississippi, sometimes known as the Lake George Site. It is the type site for the Lake George Phase (1400 to 1500 CE)]] of the Yazoo Basin region. Jaketown Site A site with two mounds in Humphreys County, Mississippi. While the mounds have not been excavated, pottery sherds found in the area lead scholars to date the sites construction and use to roughly 1100 CE to 1500 CE. Artifacts found in the area demonstrate the site was occupied from 1750 BCE to 1500 CE, making it one of the oldest continuously inhabited sites in the region. There were smaller mounds nearby that were hundreds of years older than the surviving two, built by peoples of a preceding culture, but they were destroyed by plowing and road construction in the early 20th century. 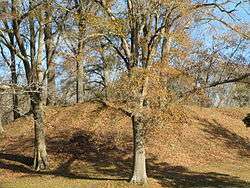 Julice Mound A mound site in East Carroll Parish, Louisiana dated to 1200–1541 CE and located less than one mile from Transylvania Mounds. Mangum Mound Site A Plaquemine site in Claiborne County, Mississippi, located at milepost 45.7 on the Natchez Trace Parkway. An avian themed repoussé Mississippian copper plates was discovered there in 1936. Pocahontas Mounds A multimound site with a platform mound and a mortuary mound and an associated village area, located in Hinds County, Mississippi and dating to 1000 to 1300 CE. Routh Mounds A multimound site located in Tensas Parish, Louisiana that is type site for the Routh Phase(1200 to 1350 CE) of the Tensas Basin Plaquemine Mississippian chronology. Transylvania Mounds A large multimound site with 2 plazas and components from the Coles Creek (700–1200) and Plaquemine/Mississippian periods (1200–1541). It located in East Carroll Parish, Louisiana It is the type site for the protohistoric Translyvania Phase (1400-1650 CE) of the Tensas Basin Plaquemine Mississippian chronology. Winterville Site A Plaquemine/Mississippian site near Greenville, Mississippi. 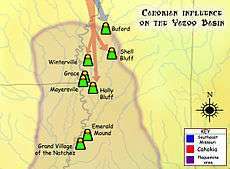 It is the type site for the Winterville Phase (1200 to 1400 CE) of the Yazoo Basin region. 1 2 "The Plaquemine Culture, A.D 1000". Retrieved 2008-09-08. 1 2 3 "Plaquemine-Mississippian". Archived from the original on 2008-06-09. Retrieved 2008-09-08. ↑ Brain, Jeffrey P. (1989). 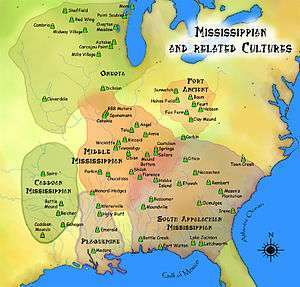 Winterville-Late Prehistoric Culture Contact in the Lower Mississippi Valley. Mississippi Department of Archives and History. ↑ Guy E. Gibbon; Kenneth M. Ames (1998-08-01). Archaeology of prehistoric native America: an encyclopedia. Routledge. p. 270. ISBN 978-0-8153-0725-9. ↑ Douglas C. Wells; Richard A. Weinstein (2007). "Extra regional contact and culktural interaction at the Coles Creek - Plaquemine transition : Recent data from the Lake Providence Mounds, East Carroll Parish, Louisiana". In Rees, Mark A.; Livingood, Patrick C. Plaquemine Archaeology. University of Alabama Press. pp. 38–55. 1 2 "Louisiana Prehistory : Plaquemine Mississippian". Retrieved 2011-10-24. ↑ Guy E. Gibbon; Kenneth M. Ames (1998-08-01). Archaeology of prehistoric native America: an encyclopedia. Routledge. pp. 657–658. ISBN 978-0-8153-0725-9. ↑ "Indian Mounds of Northeast Louisiana:Fitzhugh Mounds". Retrieved 2011-10-20. 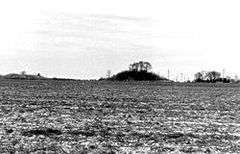 ↑ "Indian Mounds of Northeast Louisiana : Julice Mound". Retrieved 2011-10-31. ↑ "The Mangum Plate". American Antiquity. 18 (1): 65. July 1952. doi:10.2307/276247. ↑ Daniel A. LaDu (2009). 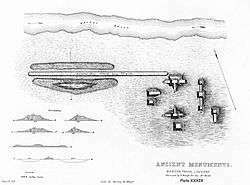 An exploration of the age of mound construction at Mazique (22AD502), a Late Prehistoric mound center in Adams County, Mississippi (PDF, thesis, Master of Arts) (Thesis). Tuscaloosa, Alabama: Department of Anthropology, University of Alabama. Retrieved 2011-10-31. ↑ James Alfred Ford (1999-10-28). Michael John O'Brien; R. Lee Lyman, eds. Measuring the flow of time: the works of James A. Ford, 1935-1941. University Alabama Press. p. 255. ISBN 0-8173-0991-8. 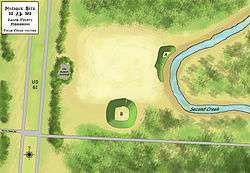 ↑ "National Park Service : Indian Mounds of Mississippi : Pocahontas Mound A". Retrieved 2011-10-28. ↑ Hally, David J. (1972). "Chapter 3 : Routh Phase". The Plaquemine and Mississippian Occupations of the Upper Tensas Basin, Louisiana (PDF) (Doctor of Philosophy thesis). Cambridge, Massachusetts: Department of Anthropology, Harvard University. Retrieved 2011-10-28. ↑ "Indian Mounds of Northeast Louisiana:Translyvania Mounds". Retrieved 2011-10-20. Wikimedia Commons has media related to Plaquemine culture.